Potato late blight has been detected in Wisconsin, but don’t think this disease has the upper hand when it comes to your vegetables. Wisconsin’s potato and vegetable growers are staying ahead of the curve to properly manage this fast-moving community disease to ensure a healthy and adequate food supply. First, a bit of background on late blight. This disease can be a serious problem to everyone growing potatoes, tomatoes, eggplants and similar crops with no distinction between commercial growers, garden centers or home gardeners. The fungus causing this devastating disease (Phytophthora infestans) is the same organism that caused the Irish potato famine and brought mass starvation to Europe in the late 1800s by destroying the Irish potato crop. Fortunately, the organism in its current form cannot survive Wisconsin’s winters. The soundest way to control the problem is to inspect seed tubers and host transplants coming into the state, and limiting the protected sites where it might be able to survive by destroying all potato waste from storage. 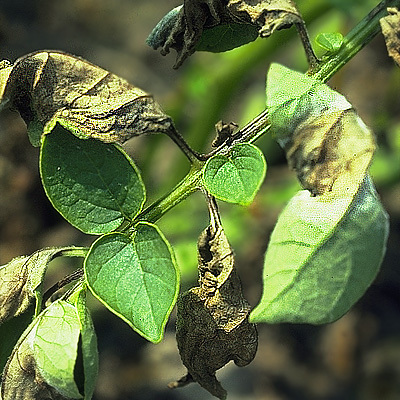 However, in spite of best efforts to limit the introduction of the disease, when weather conditions are perfect for development, potato late blight can still slip through and quickly become a problem.